Home » In Process vs. In Progress – What’s the Difference? For many of us, writing is a skill that we are continuously building. Even when we feel accomplished, we are always working to become even better. We might say that our development as writers is always in progress. Would we be better to say that this development is in process? Voracious readers have probably seen both versions of this phrase. Continue reading to discover the relationship between them. 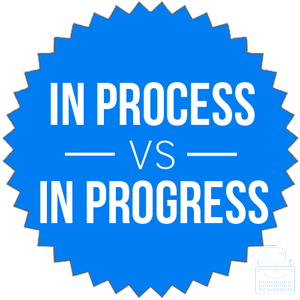 What is the Difference Between In Process and In Progress? In this post, I will compare the phrases in progress vs. in process. I will outline which of these is the more common spelling and which you should use in your writing. Plus, I will show you a helpful memory tool that makes choosing either in progress or in process easier in your own writing. What does in progress mean? In progress is an adverb phrase that refers to something that is not yet complete. If you start a project, and someone asks you about it before you’ve finished it, you might tell that person that it’s still in progress. “The transition from hard copies to digital-only records is still in progress,” the project manager told the environmental team. I am sculpting a monument to Academy Award-winning Israeli-American actress Natalie Portman, but I can’t get the cheekbones right, so it is still in progress. In progress also appears in the phrase work in progress, which is a noun phrase that denotes something that is still being finished. What does in process mean? In process is an alternate version of the same phrase. It has the same meaning, and can be used in all of the same contexts. Although in process sees some use, it is not nearly as common as in progress. This makes me think that in process is simply a malformed variant of in progress, but I don’t know enough about the history of these phrases. In some sense, in process seems to make logical sense, as does in progress, but it is comparatively rare to hear anyone use this term in speech or writing. This isn’t a scientific graph, since it only looks at books published in English since 1800, but it still clearly illustrates that in progress has been the preferred version of this phrase for nearly 200 years. These terms mean the same thing, and there is no difference between them in terms of actual usage. In progress is the more popular version at this point in history, by a factor of several times. Unless this trend reverses, you are better off using in progress in your own writing, since it will seem more familiar to your readers. Since you could say that you are making progress on something that is a work in progress, you can remember the shared words between these two expressions as a reminder of which one to use. Is it in process or in progress? In process and in progress are versions of an adverb phrase that describes something that is not yet complete. Both forms are equivalent in meaning. In progress is used more frequently and is thus the better choice. 1 What is the Difference Between In Process and In Progress?